Drs. Michael Hahn and Daniel Wolf Savin, research scientists at Columbia University's Astrophysics Laboratory in New York, NY, found evidence that magnetic waves in a polar coronal hole contain enough energy to heat the corona and deposit most of their energy at sufficiently low heights for the heat to spread throughout the corona. The observations help to answer a 60-year-old solar physics conundrum about the unexplained extreme temperature of the Sun's corona—known as the coronal heating problem. Hahn and Savin analyzed data from the Extreme Ultraviolet Imaging Spectrometer onboard the Japanese satellite Hinode. They used observations of a polar coronal hole, a region of the Sun where the magnetic fields lines stretch from the solar surface far into interplanetary space. They have posted their results at http://arxiv.org/abs/1302.5403 and are presenting them at the 44th meeting of the Solar Physics Division (SPD) of the American Astronomical Society, now in progress in Bozeman, Montana (http://solar.physics.montana.edu/SPD/SPD2013). To understand the coronal heating problem, imagine a flame coming out of an ice cube. A similar effect occurs on the surface of the Sun. 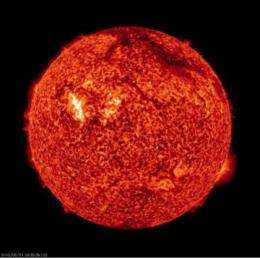 Nuclear fusion in the center of the Sun heats the solar core to 15 million degrees. Moving away from this furnace, by the time one arrives at the surface of the Sun the gas has cooled to a relatively refreshing 6000 degrees. But the temperature of the gas in the corona, above the solar surface, soars back up to over a searing 1 million degrees. What causes this unexpected temperature inversion has puzzled scientists since 1939. Two dominant theories exist to explain this mystery. One attributes the heating to the loops of magnetic field which stretch across the solar surface and can snap and release energy. Another ascribes the heating to waves emanating from below the solar surface, which carry magnetic energy and deposit it in the corona. Observations show both of these processes continually occur on the Sun. But until now scientists have been unable to determine if either one of these mechanisms releases sufficient energy to heat the corona to such blisteringly high temperatures. Hahn and Savin's recent observations show that magnetic waves are the answer. The advance opens up a realm of further questions; chief among them is what causes the waves to damp. Hahn and Savin are planning new observations to try to address this issue. The "solar heating problem" is only a problem for the standard theorists. There is no problem for the Electric Star theory, it's actually expected and matches the model. Strange. Yeah, that's probably it. You should e-mail them. Seriously though, if you follow the link and download the PDF, there's only one thing I have a question about, and that's regarding the data processing in section 2. First, they're using old data from just one observation of Hinode in 2009. Is that the only data they could have used? They only have 4 slit exposures, all taken on the same day, about a half hour apart, each pointed at a different altitude above the photosphere. There was one more exposure in the original data set, but it didn't fit their model, so they discarded it without any good justification. Second, they aren't the first to look at this data, so why didn't Hahn or Kamio see this? Third, I fail to see the justification of what they call 'binning' and using two different binning methods to fit the data to the model, 8 pixel at low and 32 pixel at high altitude. Maybe it was justified, but they didn't bother to explain it. You dolt, go read the paper. The article here misses 75% of the point of the whole thing. These guys are trying to prove that your Alfven waves are the source of coronal heating. So, lol at you. You don't understand this subject in the slightest. But, don't get all excited and pee yourself because they said "Alfven waves", because, as I pointed out in my first post, the whole paper is probably crap. Our previous Betelguese-sun novaed into a magnetar, and installed a second 'solar system' inside its former orbit. The real question is: How does the surface exist at 6000 degrees sandwiched between a core of 15 million and a corona of 1-2 million degrees? To be sure, there has never been a measurement of the core of the Sun, the 15mil degree temp is purely conjecture. These guys are trying to prove that your Alfven waves are the source of coronal heating. You're so effing dumb it's remarkable you can breathe. I guess since the article mentions Alfven I should support it? Can you read? Hey, dolt, your gaslight era internal combustion engine model of the Sun sanctified by Eddington is worthless, without merit nor predictive support. It violates the laws of physics and is puzzling because the model is so completely wrong. They may as well claim god or some other magic force did it, the same magic phenomenon that creates those "frozen-in" magnetic fields you support. Clearly it's you who doesn't understand in the slightest what is commented on or researched. Plasma is not a superconductor. "To understand the coronal heating problem, imagine a flame coming out of an ice cube." The real question is: How does the surface exist at 6000 degrees sandwiched between a core of 15 million and a corona of 1-2 million degrees? If the laws of thermodynamics hold then either the model is wrong or the measurments are. I trust what we have measured. The corona is transparent and very low density. The black body radiation from the photosphere cools it and the flow of heat back from the corona is negligible despite the high temperature because of the low desnsity. So how are the laws of thermodynamics conserved again? Heat moves from hot to cold but the density is low so the heat flow is low. The black body radiation from the Sun removes surface heat much faster and it isn't re-absorbed by the corona because it is mostly transparent. Which law do you think is not obeyed? Which law do you think is not obeyed? The law that heat moves from hot to cold. I don't believe density is the issue any more than it would be with air heating a body of water. OK, compare pouring boiling water on your hand with blowing it with hot air at the same temperature. The water transfers much more heat in the same time even though the temperatures are the same. The corona is extremely thin gas so although the heat would move from hot to cold, it does so at a very low rate. There is no heat to be reabsorbed due to the drastically lower temperature of the surface, not because of coronal transparency. The photosphere is at about 5800K but it is dense so radiates like a black body. All the heat we feel here on Earth, about 1.4kW per square metre, comes from that surface. IMO solar corona is heated with neutrino flux generated with thermonuclear reactions inside of Sun. The neutrinos do interact with charged particles preferably via transfer of magnetic momentum. How much heat does a pot of boiling water transfer to the air above the pot when the air temperature is 2 or 3 orders of magnitude higher than the water? Quite a bit, the vapour pressure would push the air away from the surface. I know were talking about density differences of 3 orders of magnitude (app) between air & water and 6 (app) between the corona and photosphere, do those 3 orders of magnitude make that much difference in the way a system behaves? That is why the corona is transparent while the photosphere is opaque. Put out a piece of black paper in the sunshine and it gets hot. Place a piece of glass in the same conditions and the light just passes through. Wrong, the cross-section is far too small. The flux we detect is barely diminished by passing though the entire depth from the core and all the corona is a dozen orders of magnitude less dense than even the photosphere. Yep, this is what the mainstream physics says. This is what basic common sense says. If they didn't pass through the corona, they couldn't pass through the much denser surface layers, never mind the core. Perhaps there's a phase change we don't know about? Like the latent heat of boiling or freezing, the material in the photosphere might store energy that isn't registered in the form of temperature, which is released as thermal energy in the corona as the decrease in density allows the phase change to plasma. Just a random thought that passed between my ears, but if we're going to toss around ideas like neutrino heating and alfven waves, then it's a free-for-all anyway. I suspect Valeria is still confused about the other recent story regarding neutrino heating in dense neutron star remnants. The density inside sol isn't sufficient to cause that phenomenon. Neutrinos are solitons of scalar waves (analogy of photons for EM wave) in AWT. Don't take gibberish. If you mean Lodge's flawed exposition of Lorentz's aether theory, nobody knew neutrinos existed in 1908 and there was no particle theory capable of predicting them. The simple fact is that any particle of escaping the core will have a free path of billions of light years at coronal densities. I proposed this explanation many years before. Your inability to learn from your errors is well documented. AWT is not Lodge's aether theory, it's just based on Lodge's dense aether idea ..
Well every time I've pointed out that there is no such theory as AWT, you have referred me to Lodge's paper. The simple fact is that you don't have any theory whatsoever, but if you insist on quoting Lodge, that's what you will be judged by. But if you need some connection to mainstream ideas, ..
Nope, if you want to talk about something you call "AWT", that is what you need to post. The reality is that you are delusional and there is no such thing as "AWT", it is a complete fantasy.